The NBA 82-game regular season finally concluded on Wednesday evening, and the playoff matchups have been set for the First Round. While most teams were locked into their playoff positions, the Los Angeles Lakers and Utah Jazz were fighting for the last spot in the rotation. Utah barely showed up Wednesday evening, losing 86-70 to the Memphis Grizzlies. The Lakers beat the Houston Rockets 99-95 to make the post-season. The rest of the playoff teams had clinched a spot in the postseason a week or two ago. We’ll preview each team headed to the playoffs, give our analysis on their projected performances and look at their potential matchups in the first round and beyond. 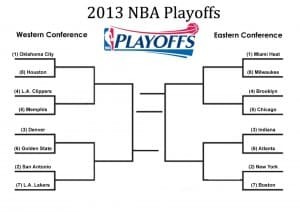 Our NBA Playoff future bet odds are provided by TopBet, one of world’s top online sportsbooks. TopBet.eu: This top book is currently offering a 50% Deposit and Reload Bonus up to $250, plus a free bet on the 2013 NBA Playoffs. Bovada.lv: The top online sportsbook for US players is offering a Deposit Bonus up to $250 and free online casino chips for betting on NBA player props. Bovada offers a vast assortment of NBA playoff props and futures. The 2013 Miami Heat have been one of the most dominant teams to in NBA history and are odds on favorites to win the title. Listed at -175, they are massive favorites to win the title, especially compared to the rest of the field. The Oklahoma City Thunder are a distant second in odds to win the championship, at +425. Led by LeBron James, and what is surely a back-to-back MVP season for the King, the Heat are a team with almost no weaknesses. A dominant big man is perhaps their only problem, but their small lineup is more than effective with the absence of big men and has changed the way the game is played. After all, the Heat own the NBA’s second longest winning streak as they won 27 straight games this season. While Miami looks poised to repeat as champions, NBA fans must remember how teams can come out of nowhere and challenge for the title. In a quest for their title last year, the Heat were down 3-1 in a series against the Indiana Pacers. Any team can be beaten. Few would argue with a bet on the Heat to win the title, but it is far from a sure thing. The Knicks have had one of their best seasons in years and look like a team that could contend for a championship. New York has the tools to push for a title, and Carmelo Anthony finished with a career season averaging 28.7 points per game. The Knicks have a deep team that is led by their strong defense, but do they have what it takes to put together a playoff run? Carmelo has always been criticized for his lack of postseason success throughout his career and there is no doubt he is motivated to change that. At +1800, the Knicks look like an attractive wager. Their first round matchup with the Celtics is worrisome as Boston is a tough team that will not go quietly, but we think the have their number this time. The Knicks will likely make it past the Celtics but will then have another tough matchup on their road to the title. Their road will almost certainly run through Miami, as well. Bettors will have to gauge their own opinion on the Knickerbockers. Even though, they have their best team in a decade it may not be good enough to make a serious run in the playoffs. The Pacers have a new adopted a new identity over the past few seasons that preaches defense first. Paul George has become the face of the franchise while an injured Danny Granger will likely not be retained as he is a free agent at the end of the season. While the Pacers are one of the best defensive team in the league, they have been inconsistent on offense and have dealt with long scoring droughts. Still, their defense keeps them in games, and they have one of the larger front courts in all of basketball. Roy Hibbert and David West are an imposing frontline no matter whom the Pacers are facing. It is hard to consider a 3rd seed a dark horse, but Indiana does seem to have that moniker attached to them. If we remember back to last season, the Pacers gave the Heat a run for their money in playoffs and are clearly a team capable of pulling an upset. The Nets have had an up and down 2013 season, but the team has turned it on late with wins at Indiana and Chicago. Darren Williams has been surrounded with over $80 million in talent dating back to last season, but some of those deals have not worked out. Gerald Wallace’s career has seemingly hit a wall as he struggled for productive minutes, and while the bench has given the team a lift in recent weeks – they are largely unproven. The Nets defense has never been accomplished, and if they are going to make a run in this year’s playoffs it will have to be on the back of Darren William and Brook Lopez. If they happen to get passed Chicago – who has had a rash of injuries before the postseason – the Nets will still have a hard road. Running mostly half court sets, Brooklyn will need shot creation from not only Williams but Gerald Wallace, Brook Lopez and Joe Johnson. We do not love the Nets this year, but if Williams and company are hitting their shots, who knows where the Nets will end up. The Bulls have put together a productive season despite still not having their best player, point guard Derek Rose. Though there have been rumors that Rose may return this postseason, all signs point to him not retuning until next season. Still, the Bulls have plenty of offensive weapons and a strong defense. They were bounced in the first round of the playoffs last season after Rose’s torn ACL. The Bulls aim to make it at least past the first round this year and have the experience and talent to do so. Joachim Noah is not 100 percent healthy, which is a concern, but the big man is still a formidable player at 70 or 80 percent. The Bulls do not have lofty expectations this year, and for some across the country they are certainly an afterthought. There is tremendous talent on this team and deep productive bench. The Bulls could certainly be that surprise team that makes some noise this tournament. The Hawks have had plenty of ups and down throughout this season as they look regain their positive play despite a poor finish to end the season. At a top much of the East throughout the season, Atlanta is certainly not devoid of talent. However, they have struggled to end the season, losing 8 out of their last 11 games. The frontcourt is the ATL’s strength, not only do they have All-Stars Al Horford and Josh Smith, but extra added toughness in the form of Zaza Pachula. This draws opposing defender into the paint and allows them to kick to excellent three point shooters in DeShawn Stevenson and Kyle Korver. However, we do not think Atlanta has enough to contend. Their first round matchup is tough enough against the Pacers and even if they advance – which is not likely – they will face an even tougher draw in the next round. The two man show of Horford and Smith will not be enough to take the Hawks far in the playoffs. The good news for Hawks fans is that they will have plenty of cap room this summer and should make a splash in free agency. The Celtics are another team that has had its fair share of poor play this season, but have righted the ship just enough to get into the playoffs. At 41-40, Boston is just one game over .500 but bettors shouldn’t sleep on this team. Boston has suffered from injuries all season, including an ACL tear for Rajon Rondo who will miss the entire postseason. Garnett will be ready for the start of the playoffs but it is likely he will not be at 100 percent. Still, the Celtics seem to always give teams a run for their money in the playoffs and can easily force even the best teams into 6 or 7 games. Boston may just one more run left in them as rumors swirl that Pierce and Garnett may be traded in the offseason – these veterans will do their best to go out with a bang. We’re not slighting the Bucks by giving just them a little write up here; it’s just their opponent in the first round so much better. Milwaukee may be talented enough to steal a game from Miami, but that’s all they will be doing. Heat win in four or five games – nothing to see here folks. Off of a Finals lost to the Heat last season, the Thunder have one goal in mind – winning a championship. With the West’s top record a number one seed, they are in a position to head to the finals once again. Relying on Russell Westbrook and Kevin Durant for most of their scoring the Thunder are one of the quickest teams in the league and beasts in transition. Their offense is not complicated, (mostly pick and rolls for Durant and Westbrook) but it works – it works exceptionally well. The Thunder are better than they were last year, even with the loss of James Harden to the Houston Rockets – who coincidentally, OKC will face in their First Round series. The Thunder have a deep run in them this year and many consider them a lock to be in the finals out of the West. The Spurs have dealt with their fair of injuries down the stretch as they fell to the No. 2 seed after having the best record in the West for much of the season. With Popovich at the helm, a playoff berth seems almost a certainty, and though San Antonio is old they are well coached and have plenty of young talent and a deep bench. Manu Ginobili and Tony Parker have been injured for much of the season but will be both be available for the start of the series against the Lakers. Tim Duncan also seemed to find the fountain of youth this season, having one of the best season of his career at age 36. The Spurs have become an afterthought in the playoffs despite their high seeding over the past few seasons. Make no mistake, when this team is 100 percent they are a force to be reckoned with and could be the best team in the NBA. At +6500, they offer excellent odds for a team seeded as high as they are and could provide a nice payout if they should cash. The key is keeping Duncan, Parker and Ginobili healthy – if they can keep their core at full strength, San Antonio can beat anybody in the league. The Nuggets come into the playoffs with their best record in a number of years and are loaded with depth and talent. Denver seems to have a different guy stepping up every night. Denver loves to run the break. Led by Ty Lawson and jack of all trades small forward Andre Igoudala and a productive bench, their stamina and speed wear down opposing defenders. Unfortunately, Denver has run into injury problems down the stretch. Gallanari is out for the rest of the postseason, and Ty Lawson may not be available to start the series against Golden State. Kenneth Faried, Denver’s top rebounder also is expected to miss 1-2 games to start the playoffs. For +2700, we’re not super keen on the Nuggets. We figured oddsmakers might offer a better price, especially considering the rash of injuries to hit Denver as of late. Their frenetic pace may be hard for opponents to handle but will also take a toll on the Nuggets themselves. Also, Gallanari’s injury is a bigger blow to them than most may think. Denver is a talented team, but we cannot see them making out of the Second Round in the tough Western Conference. After a season of win streaks and inspired play by the Clips for much of the season, LA has come back down to earth in the second half. However, the Western Conference is tight. The Clippers only finished two games back of the Spurs and one game back of the Nuggets. The focal point of the Clippers’ offense is Blake Griffin and Chris Paul, but LA plays 9-10 guys deep. They have a loaded bench that packs a scoring punch and the extra bodies to keep their starters fresh. Jamal Crawford, Eric Bledsoe and Matt Barnes all average at least 11 points per game off the pine. How far will the Clippers go? LA can handle a playoff format better than any other team in basketball due to their deep bench. They also have the best point guard in the league in Chris Paul and a budding superstar in Blake Griffin. This team is flying under the radar right now and could payoff hugely for bettors who back them in this year’s postseason. The Grizzlies had their best season ever in 2012-13. The team had a franchise record 56 wins, despite trading away one of their top players in Rudy Gay. The Gay trade brought a few players into the fold, but most notably Detroit’s Tayshaun Prince. Prince has started for the Grizz since the trade and brought his defensive toughness and all around game to Memphis. He helps anchor a strong core of Mike Conley, Zach Randolph and Marc Gasol. As we seemingly say with every team out west, Memphis is another extremely talented team that is capable of winning it all. Deeper than most teams, sound defensively and strong off the fast break despite losing their top wing – the Grizzlies will be a tough matchup and an especially formidable second round opponent. 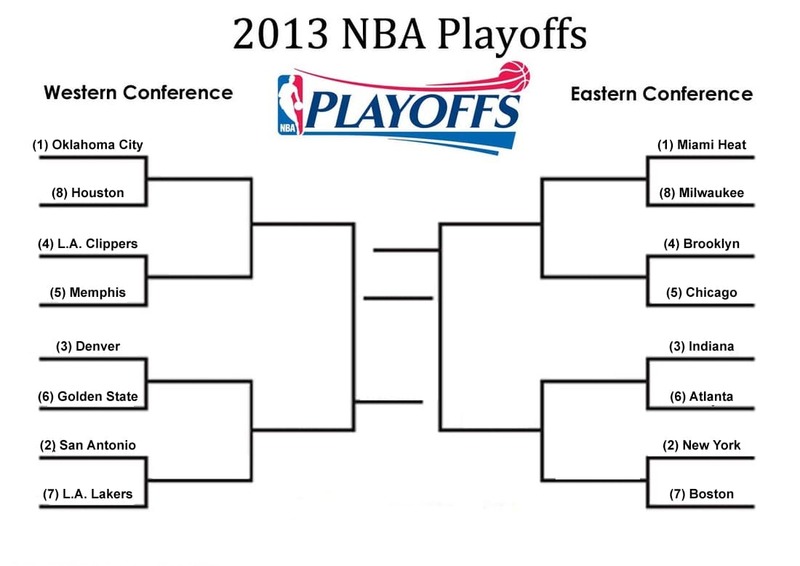 Golden State finds themselves checking in as a 6th seed in this year’s dance. It has been an up and down season for the Warriors, but one of the best in years. This team has a lot of young talent and could be a major force in the coming years as Curry and Thompson continue to improve. Steph Curry has become one of the more dynamic players in the league. He is one of the best three point shooters in the game and may be one of the best in history once it is all said and done. He set a record for three pointers made this season with 272, breaking Ray Allen’s record of 269. He has become a true elite threat on the floor as defenses have begun to double team or assign their best defensive player to the young point guard. Curry and Klay Thompson are two of the best shooters in the game today. David Lee can be almost unstoppable at certain times when he is hitting from mid-range, and while Andre Bogut has been hobbled all season, when he is on, he is still a game changer. For +15000, we like the Warriors a super speculative pick. At these odds, we feel like bettors are getting a more than fair value for a team that has a lot of weapons and a young superstar in Steph Curry. The Lakers have had a disappointing season considering their talent level, and though they have played much better in the second half of the season, (winning 28 of last 40 games) there are still many issues with this squad. The loss of Kobe Bryant (torn Achilles) for the rest of the season is obviously a massive blow, but this team has had chemistry issues all season long. They were not an elite team with Kobe, and they certainly are not now. Steve Nash looks to be back for the playoff opener, but has also dealt with serious injury issues. Many experts say the Lakers can still put it together and make a run, but at +6500, there are much better options. Even at 100 percent, this team is not a title contender. The lore of the Lakers can only go so far – this team is just not very good. The Rockets have improved mightily this season and have a nice solid core that will no doubt be competing for a championship for the next few years. As intriguing as a Harden vs. Oklahoma City matchup is in the first round – it may not be worth the hype. Houston does not have the squad to compete with OKC in a seven game series. Even if, they pulled a miracle upset against the Thunder, their road will still be littered with tremendous competition for them to advance. Even with these high odds offered – we cannot recommend backing Houston. In the same realm of odds, we much prefer Golden State +15000.